Sports injuries are common sources of knee injury. It is important it is properly assessed so that the right treatment can be given to avoid long term problems with sports and further injury. A common operation done for a torn anterior cruciate ligaments. 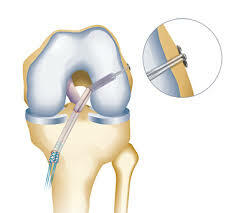 It is done completely by keyhole surgery by the latest anatomic technique using Hamstring or Patellar tendon graft. The choice is based on the medical need of the patient. It is very successful at correcting the problem and can prevent meniscal injuries, which often occur if neglected and twisting sports are continued. Associated injuries to the postero-lateral ligaments occur and can be treated at the same time, if necessary.